When I was nineteen, I taught myself Chinese by reading the poetry of Ai Qing in a bilingual edition that I carried in my backpack when traveling across China. The language was vivid, simple and direct. The causal relationships were clear, making the poems a kind of doorway into political realities of twentieth-century China, and into a mind born to a state of exile—internal and external. The poems I labored over that year shaped my heart. At that time, I didn’t know that Ai Qing had a son by the name of Weiwei. When I discovered Ai Weiwei’s work years later, it appealed directly to my own art and my interests in the intersections of human ecology, art, and political dissidence. I recognized both the play and gravity of a poet’s intellect at work. I still remember the moment I realized that he was the son of Ai Qing—suddenly, I saw a lineage of mind. This father and son reflect each other across time in profound ways: in championing humanity, in the seemingly unavoidable confrontation of the individual and the state, and in how the creative mind dares to confront brute power with words and art. Such minds extend beyond geographical and cultural boundaries. Whether in the sands of the Gobi Desert or a subterranean warehouse in Berlin, they are keenly aware of their present conditions, and insist that their actions have consequences. In 2015, I contacted Ai Weiwei, then under house arrest, to ask if I could exhibit his work on a remote island in the Salish Sea. To my amazement, he agreed. Ai Weiwei: Fault Line, the resulting exhibition, included work related to the 2008 Sichuan Earthquake. 5,196 children were killed in the earthquake. Ai Weiwei worked to gather their names at great personal risk so that those children would not be forgotten. I used the translation of these children’s names as a point of departure to write a collection of poems titled “A Forest of Names”, some of which have appeared here, in China Heritage. 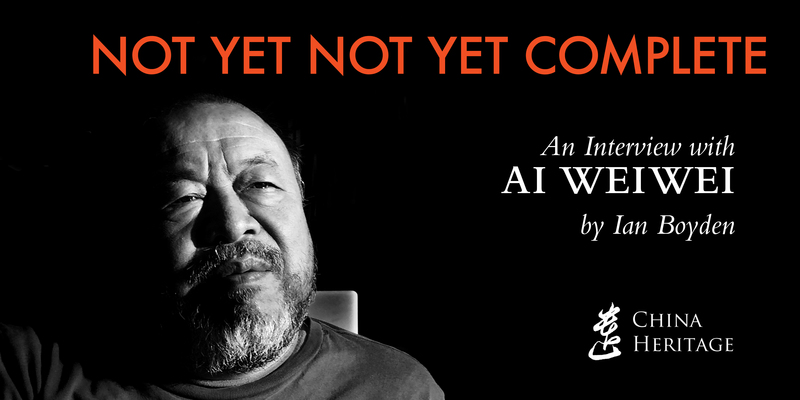 Towards the end of that project, I had the opportunity to interview Ai Weiwei in Berlin. This interview was edited into its current form from conversations that took place over several days, including a trip to Prague and conversations about his father and his father’s work. My thanks to Darryl Leung, Press and Publications Manager at Ai Weiwei Studio, for his extensive help with this project. My appreciation to Jennifer Boyden and Michelle Piranio for their advice and editorial prowess. And my gratitude to Geremie Barmé for providing a home for this interview in China Heritage.